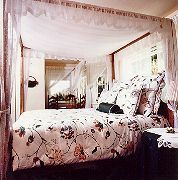 Featured in Country Inns and named by the readers of Sunset Magazine as one of the best Bed & Breakfast Inns in the West, the Channel Road Inn is located in rustic Santa Monica Canyon just one block from the beach. All fourteen rooms in this historic home are individually decorated and all have private baths. Some rooms have jacuzzi tubs, ocean views, decks, patios or fireplaces, all offer telephones, cable television, fine linens and a respite from the hectic outside world. A full breakfast of California fresh fruits and juices, baked breads and an egg souffle is served each morning. Afternoon tea and our chocolate chip cookies are served in the afternoon in front of the soothing fireplace, wine and cheese served in the sunny well stocked library. A hillside Jacuzzi and bicycles for exploring the 30 mile ocean-side bike path are both available for guests' enjoyment. Several of the city's well-known restaurants are within walking distance and the famous New Getty Center is just 10 minutes East. This and other Santa Monica Bed and Breakfast Inns can be found here in The Register. 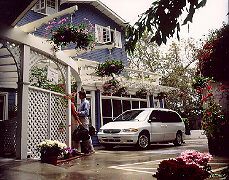 Romantic Country Inns, Getaways and B&Bs offer a great Los Angeles lodging alternative to big hotels.